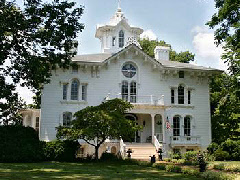 Built circa 1859, this Italianate mansion is rightly listed on the National Registry of Historic Places and considered a Virginia Historic Landmark. Benefiting from some exceptional guest reviews, The Mayhurst Inn offers just eight guest rooms and bed & breakfast accommodation. Both Washington DC and Richmond are within reasonable driving distance of the property. The building is inextricably linked to the Civil War, with Generals Stonewall Jackson, Robert E Lee, and Ambrose Powell Hill all staying here. The house served as the headquarters for the Army of Northern Virginia’s III Corps, and it is said that thousands of troops pitched their tents on what is now the lawn during the winter of 1863-64.